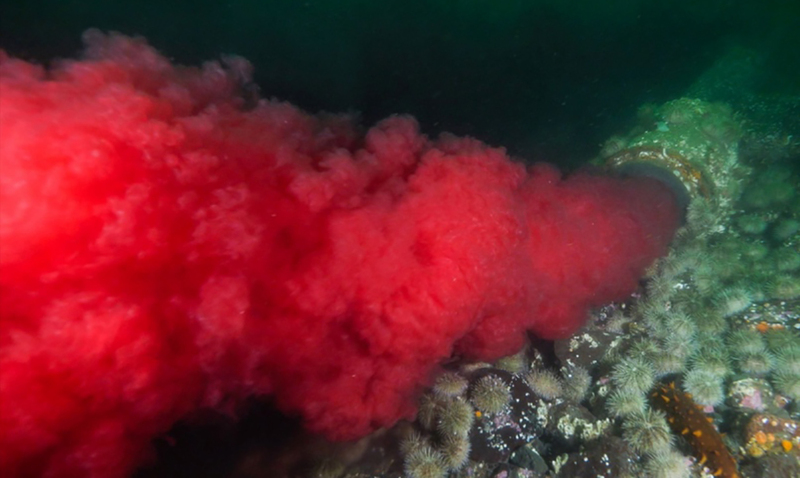 Blood is streaming out of an exit pipe that is believed to belong to Brown’s Bay Packing Company into the bay, right along British Columbia’s largest wild salmon migration route. How could this ever be considered okay? Filmmaker Tavish Campbell came across this mysterious sight during a series of dives he was doing in April, June, and October just this year. This slightly disgusting outpour pipe has been raising fears of blood-borne viruses in fish especially since a third of all wild caught salmon in British Columbia swim past this bay. Along with making the footage, you will be able to see below Campbell also took samples of the blood water and sent them in to be analyzed. The samples did in fact test positive for things like intestinal worms and piscine reovirus (PVR). PVR is a contagious disease that while it is not dangerous to humans can cause severe damage to the skeletal muscle and heart of salmon. However, the industry in BC seems to have a different story. The Brown’s Bay Packing Company claims in a statement on their site that they disinfect all discharge before it is released. Unfortunately, this is something that is perfectly legal. Browns Bay Packing Company, like all plants processing farm-raised Atlantic salmon in B.C., disinfects effluent before it is released into the marine environment. While the liquid discharged remains red in colour, the treatment process is designed specifically to treat for fish pathogens. The treatment of that effluent is to a level higher than Provincial standards for fish plants, and is governed by a Memorandum of Understanding (MoU) signed by all companies farming and processing Atlantic salmon. The MoU explicitly states that all plants will have a functional disinfection system in place, all water/ice, blood-water, wash-water and other wastewater within the processing plant will be collected and treated through the processing plant central treatment system, all blood-water and wastewater used during off loading and transport from the boat to processing plant will be contained and treated. The disinfection standards in the MoU are designed based on the Norwegian standard – which has been determined to be effective in in-activating fish virus’. While Campbell has said he does not believe the plant is doing anything illegal (as what they are doing is legal). There definitely need to be more regulations set out for that specific industry. I guess what he means is, if you are going to let a company pump blood into the bay the blood needs to REALLY be pathogen free. However, it does seem politicians are listening and Campbell’s video bringing awareness to this topic is making a difference big time. Change seems to be in the works. This footage is bringing to light something most people never stop to think about. What do you think about this? What do you think will be done and how could this have already affected the salmon population in that area? Inspired by an article written by IFLScience.